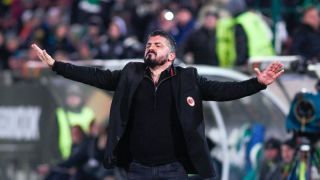 AC Milan are facing a gruelling scrap to secure a top-four finish in Serie A this season, and Gennaro Gattuso could certainly do with reinforcements in January. The Italian tactician has lost a whole host of key players to injury in recent months, with Giacomo Bonaventura ruled out until next season, while Lucas Biglia, Alessio Romagnoli, Mateo Musacchio and Mattia Caldara have all had lengthy setbacks. On top of that, they’ve left themselves short in attack, with Gonzalo Higuain and Patrick Cutrone the only strikers available. That becomes even more problematic when Gattuso adopts a 4-4-2 system and has no alternative option on the bench. In turn, it’s clear where Milan need to strengthen and as they continue to make hard work of opening up a gap between themselves and their rivals for a top-four spot, it’s hoped from their perspective that they are able to bring in key signings in January. As noted by Sky Sport Italia, Lucas Paqueta is expected to officially join in January in a €35m deal, and so that is one crucial addition to cross off Gattuso’s Christmas wish-list. The Brazilian starlet will look to bring creativity and a goal threat through the middle, but that won’t address all the issues in that department. In turn, with Calciomercato noting Milan’s interest in Chelsea stalwart Cesc Fabregas, albeit the 31-year-old is said to be valued at €10m, it’s crucial that they snap him up. His experience, leadership and technical quality could make a huge difference in midfield, but naturally it’s suggested that Milan will want to pay less than that, especially for a player who will see his current contract expire at the end of the season and who hasn’t had much playing time so far this season. As noted by Goal.com, Milan will not be welcoming Zlatan Ibrahimovic back in the New Year. As a result, they will have to consider alternative options while also remaining aware of their FFP issues, as per BBC Sport. While countless names have been linked with a move to the San Siro to address the problem, there is one target that refuses to disappear and it involves another popular reunion. Calciomercato report how Alexandre Pato has been linked with a return to Italy, although his €25m release clause and wages could yet prove to be problematic. In turn, it’s added that Milan want to sign him on an initial loan deal. The 29-year-old bagged 63 goals in 150 games during his previous spell with the Italian giants, winning a Serie A title in 2011. Having put his injury troubles behind him and rediscovered some impressive form in China, perhaps he could serve as a short-term solution to offer some additional firepower behind the likes of Higuain and Cutrone.